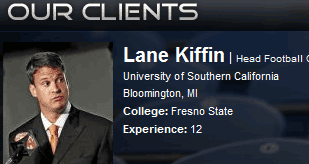 Lane (and Monte) Kiffin's agent, Jimmy Sexton, has updated his web site to reflect the new employer of his clients. 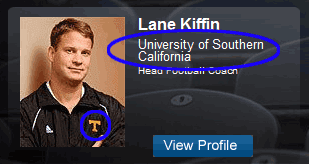 But from a public relations standpoint at both Tennessee and Southern California, he might want to get some fresh pictures of the younger Kiffin. You can look at them yourself and form your own opinion of course. The second one is just not that flattering. Interestingly, it was reported that former Tennessee coach Phillip Fulmer was expressing his willingness to assist in the search for a new coach. As he is also a client of Sexton's, should this not be viewed as a conflict of interest? And why is the media not reporting on this?